A defining characteristic of the Tokyo cityscape is that it is always changing. Stay away from any given neighborhood for a few months, and you may not recognize it when you go back. I was reminded of this for the 9,000th time a few days ago when I walked along the Omotesando shopping street for the first time in quite a while and saw what was happening around the Tod’s building. Since its completion in 2004, the Tod’s building has been a major landmark of the area, and a darling of architectural critics. It was the designed for the precise spot on which it stands, but that spot is now changing around it. As the Tokyo flagship store for a luxury Italian shoe brand, this building had a mission to be eye-catching, but the facade had to be squeezed into a narrow sliver of street frontage. Architect Toyo Ito’s design, however, doesn’t look squeezed at all. The building’s exterior is more window than wall, especially near ground level. Watch this video I quickly shot the other day and see if you think the design works for you. When the Tod’s building was new, a video with these views would have been impossible. The building sits on an L-shaped peice of land, with most of its bulk set back from the street. 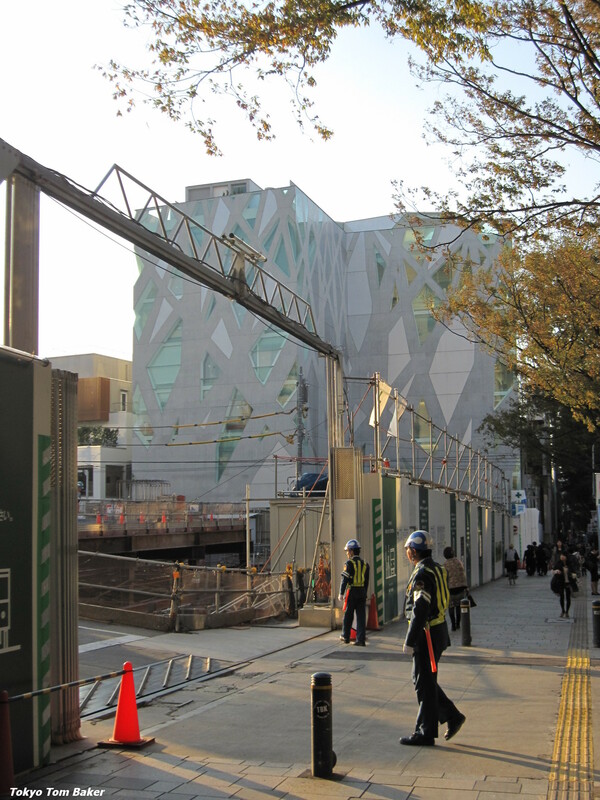 Until recently, an unrelated building standing in the crook of the L (which you can see on the second page of this presentation) prevented Omotesando pedestrians from seeing much of Tod’s sides. But now that other building has been torn down. With its neighbor out of the way, you can now see two more of Tod’s walls — each bigger than the front — and thus appreciate an otherwise hard-to-discern aspect of Ito’s design. He took one silhouette of one tree and repeated it at irregular intervals to create a forest motif that wraps all the way around the building in one continous pattern. But these views won’t last. According to signs posted on construction barriers, a new 8-story retail building is set to go up in the crook of the L. The planned completion date is April of 2013. And right next door, on an even larger lot that is slightly uphill, work has begun to build a 9-story office and retail building. In a further sign of how quickly Tokyo changes, there is another active construction site right across the street, and even the famous Kiddy Land toy store nearby has been demolished to make way for a new incarnation of itself. So if you want to see the Tod’s building’s wraparound design with your own eyes, don’t wait too long. This chance may never come again. 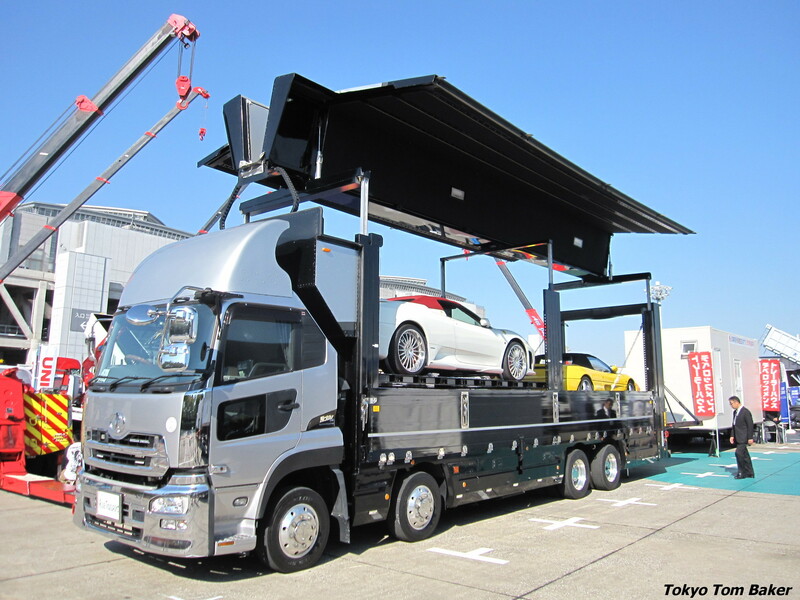 Today was the opening day of the 2011 Tokyo Truck Show, so I dropped by the Tokyo Big Sight convention center to have a look. At the time of this post, the show has two days left. There were dozens of trucks on display, many inside the exhibition halls and even more parked in a large fenced area outside. In addition to the standard cab-in-front-of-a-box arrangement, there were a great many specialized trucks to examine, including tanker trucks, dump trucks, garbage trucks, tow trucks, the car carrier in the photo above (which looks even cooler to my eye than the snazzy sports cars it has aboard) and the giant vacuum-cleaner truck in the photo below. The drive-in printer, made by the Tokyo-based LAC Corporation, is called an Auto Body Printer in Japanese, and Vehicle Art Robo in English. According to the company’s website, the same technology is also used to print designs on refrigerators, surfboards, suitcases and cell phones – basically anything with a hard surface. It takes just under two and a half hours to complete a 10 meter by two meter image. The printer was just one piece of truck-related merchandise on display. Other exhibitors were promoting everything from leaf springs to drivers’ uniforms. 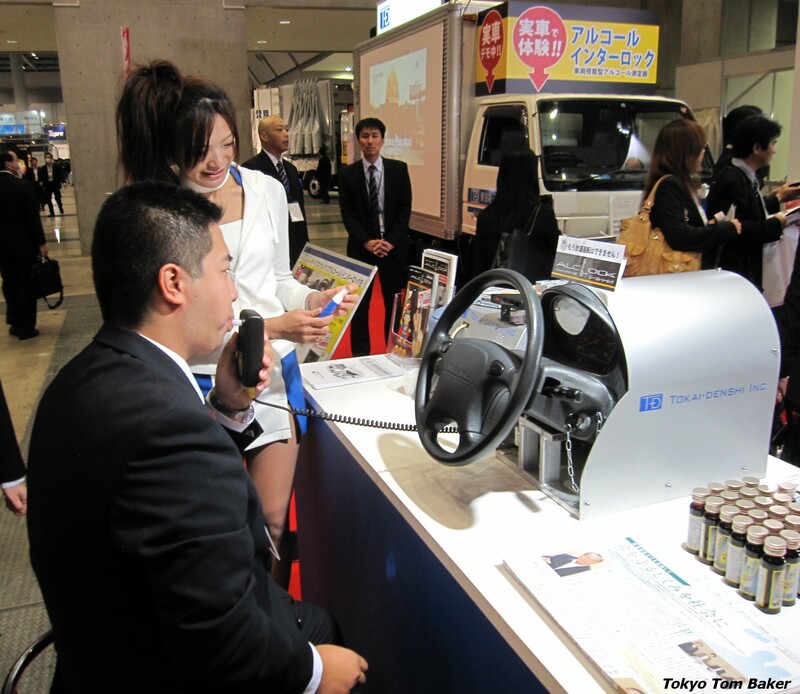 The Tokai Denshi company, based in Fuji, Shizuoka Prefecture, was demonstrating its ALC-Lock device (photo below) that will prevent a driver from starting a truck while drunk. Two other devices impressed me with the idea that there is always room for innovation, even regarding the most everyday objects or situations. 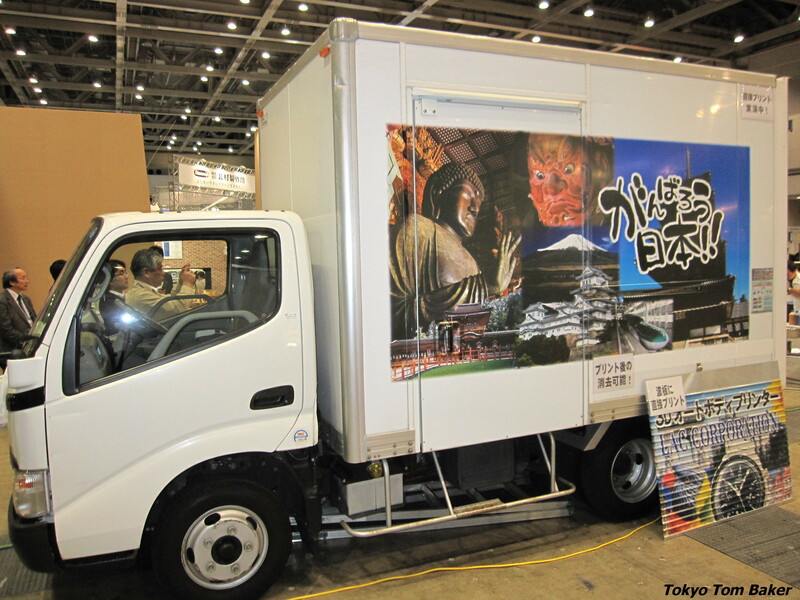 The truck in this photo was displayed at the show by Ohpado, a Yokohama-based company whose website shows them to specialize in baked goods rather than trucks per se. 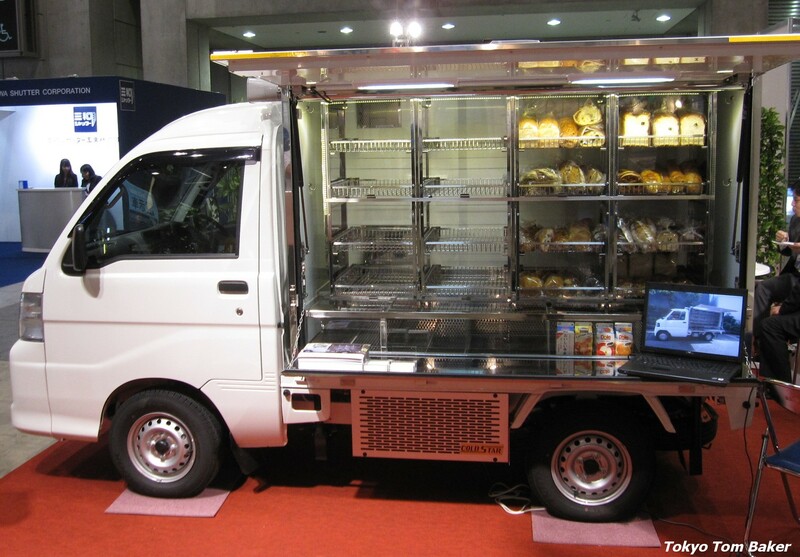 In fact, I have once or twice glimpsed such a truck selling baked goods to office workers in Ginza. Perhaps it was an Ohpado truck. In any case, despite the nickname we gave the van, my fellow movers and I eagerly ate many of its sandwiches back in the day, and the pastries shown at Ohpado’s website look like they’d be quite nice. 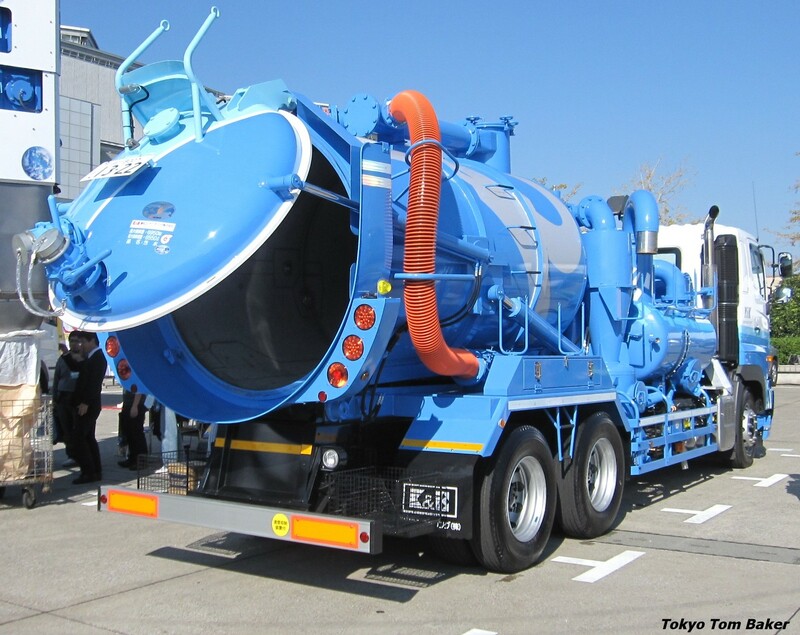 The 2011 Tokyo Truck Show runs through Saturday, Oct. 29, at the Tokyo Big Sight convention center. The hours are 10 a.m. to 5 p.m., and admission is 1,000 yen. It is not aimed at children, but I did notice one man there with his very small son, and I think a kid who likes trucks would get a kick out of seeing so many in one place. The show is entirely in Japanese. You are currently browsing the Tokyo Tom Baker: The Blog blog archives for October, 2011.